The increasing popularity of online shopping, combined with years of chronic overbuilding and shifting consumer preferences, has led to what some are calling the “retail apocalypse.” While the word “apocalypse” is probably much too dramatic, it’s true that traditional retail is experiencing a downturn. The most recent example of the ongoing issues in retail is the bankruptcy filing of Toys “R” Us, which occurred after unsuccessful attempts to reverse the company’s lagging profits. An article in the Harvard Business Review discusses the Toys “R” Us bankruptcy and whether it truly indicates an “apocalypse” for traditional retail. According to the article, the current changes in the retail industry are nothing new. Fifty years ago, department stores became popular in urban centers, while the rise of the automobile led to suburbs and shopping malls. A number of big box discount stores, including Toys “R” Us, opened, attracting consumers looking for a wide variety of available items and low prices. Now, 50 years later, consumers are again looking for variety and low prices – and they’re finding it online and in mass retailers. More fundamentally, the article states, “the basic function of a physical location has changed.” Previously, the brick and mortar store was the only place at which a transaction could take place. Now, sales take place anywhere, any time. If retailers are going to succeed in this new 24/7 industry, they need to do more than simply offer sale transactions. They need to offer a service, solve problems, build relationships and, ideally, upsell. Another innovative idea is the “shoppable showroom,” in which customers can do everything they’d normally do in a retail store – get fitted for clothing, test new items, place orders and make returns – but at a store in which no actual inventory is stocked. Whatever the ultimate strategy, the article encourages retailers not to double down on a losing tactic, but to be aware of the trends and shift efforts to meet what customers want now. 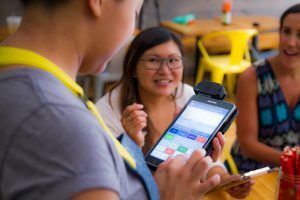 As retailers navigate the changing landscape, Retail Tech is there to help with a wide variety of new and refurbished POS equipment. We offer installation and staging, PoS printer repairs, and more. Contact our POS systems specialists for help finding the perfect point of sale solution for your retail store. The restaurant industry is notoriously difficult. Long-term restaurant success and profitability can be hard to achieve, making it vital to be aware of the day-to-day performance of the business. To make that easier, PointofSale.com recently published an article highlighting seven key restaurant performance metrics, with advice on how to evaluate them. We’ll share those tips below. For point of sale systems to help with restaurant efficiency, performance and reporting, check out the full Retail Tech catalog of new and refurbished PoS systems. This number – which is the amount that a restaurant must make in sales to earn back an investment – should be calculated first. Then, additional projections can be made based on that number. It can be used for the opening of a new restaurant or when a big purchase or improvement is made. This refers to the cost required to create each of the items sold to customers. Because this is usually one of the largest expenses for restaurants, this will allow owners to identify ways to minimize these costs. This is a way to look at a restaurant’s fixed costs (rent, utilities, etc. ), broken down to an hour-by-hour or day-by-day basis, allowing for a more incremental view of how much it costs to run the restaurant. This is the sum of the cost of goods sold (detailed earlier here) and the total labor costs, including wages, benefits and any others. This is a good summary number of all of a restaurant’s controllable expenses, and shows how careful labor management could lower costs and increase profit. This is the difference between the cost of the ingredients in a specific menu item and that item’s selling price. After accounting for the cost of the goods sold, this number shows the profit made by the restaurant, which represents the money available for paying expenses and for profit. Because the restaurant industry has a high turnover rate, it’s important to track employee turnover – the percentage of employees that quit or are fired – for maximum operational efficiency. Experts recommend that owners calculate these restaurant performance metrics regularly – monthly or weekly – and identify trends in order to identify and fix problem areas and improve performance and profits. Retail Tech is proud to be a partner of the restaurant industry. We carry a wide variety of new and refurbished point of sale (PoS) systems and parts. We offer key services, including installation and staging, and PoS printer repairs. Contact our point of sale systems specialists for help finding the perfect solution for your business. Now, the hybrid solution is not for everyone. Yet, it can be a great option to consider especially if the following two scenarios apply to you…. You are a budget-conscious consumer. — Hybrid solutions allow you to better allocate your money on the newest technology rather than lesss important upgrades. By saving costs in the display, cash drawer, keyboard, or other peripherals, you can budget more for a newer base unit. You need platform consistency—What if you only want to do a partial POS upgrade? With a hybrid solution, keep your old peripherals and spend money on the base units only! Retail Tech has a state of the art integration facility where this is made possible. So next time you think you can’t have it all, think again. Eliminate the “or” in life just this once, low costs “and” new technology. What could be better? ?